Apple could have problems obtaining iWatch trademark in some countries, including the U.S.
Over the last week, Apple's regional attorneys have been on a Tasmanian Devil-like whirlwind tour of countries, filing trademarks for the iWatch. This is expected to be the name of Apple's rumored smartwatch. So far, it has been smooth sailing for Apple in places like Mexico, Japan and Russia. But when Apple gets around to the U.S.,China and U.K., there might be some difficulties. According to a published report in China, in that country both "iWatch" and "iWatching" have been trademarked. In the states, a company called OMG Electronics that unsuccessfully tried to raise money to build a smartwatch on crowd-funding site IndieGoGo, owns the "iWatch" trademark. The good news there is that the company will probably be open to selling the trademark for the right price. In the U.K., a company called Probendi has the right to the "iWatch"name. This company owns a monitoring smartphone app that "sends real-time audio, video and location data to the Critical Governance platform." The problem for Apple is that the trademark covers the entire EU. Apple has already been through the Chinese trademark process when it ended up having to pay $60 million to Chinese company Proview for the right to use the iPad name in the country. In that case, Apple though it had secured the right to the iPad name throughout all of China, but had negotiated a deal with a division of Proview that had the right to the iPad name for Taiwan only. This time around, 9 companies have registered the "iWatch" name in China, but most of them are invalid. A trademark in force for the name "iWatching" might be enough to give Apple trouble. Perhaps Apple should try something truly revolutionary - call it the Apple Watch. Or, the iPod Timekeeper? They have problem with trademark because they are super predictable. The ipod timekeeper is a great name. +1 sir. Apple need only too patent its "iWatch" name in the U.S.A., and it will be synonyms for that type of product in the whole industry. Every wristband watch in the world be it LG, HTC, Foxconn, Samsung, etc... Will be subconsciously known as a iWatch! ;) In any other country let them call it what they want. It's a iWatch. Perhaps they should consider iTime as in, "what aWaste of iTime." iChrono tiMepiece tiMekeeper Thats all I've got. Not many synonyms for watch. How about iToy? We all know the watch will be useless. iTime, iWristphone. Apple is running out of iNnovative names lol. Trying too take/steal a name again apple? Learn too come up with your own name instead. the problem i see with a smart watch is no one wears watches anymore... and i dont see the watch doing anything a smartphone cant do in my pocket. 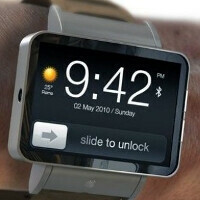 Any technology put into this watch will be put into a phone... and i doubt the watch is going to replace phones. Would make a good gps running watch if teamed up with runkeeper or other app. Bundle it with some bluetooth headphones and very amateur runners will love it to run to music.. Would be good it it could take a prepaid sim so you don't have to carry your cellphone with you. You only need a phone for emergencies when running anyway.